Tuscany, Italy, last year. The first thing our guide to the Etruscans said was, ‘Everyone calls the Etruscans “mysterious” and it’s simply not true.’ By the end of the week, I thought: You’re wrong. Yes, thanks to archaeology, we can see inside their tombs; admire their grave goods, the amazing terracotta sculptures, and their famous black bucchero ware; and we know what the Romans thought of them. But, for me, the Etruscans themselves still remain fascinatingly elusive. This is why. Take the over life-size terracotta statue of Apollo, full of purposeful intent, which once strode along the roof top of the Etruscan Portonaccio temple at Veii, from about 500 B.C.. There are still traces of colour and, when I saw him, the hairs on the back of my neck stood up. He was one of four gods on that roof and they must have looked amazing. 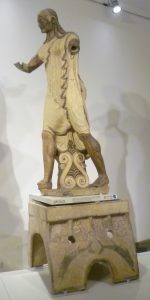 Or look at the statue of Latona, the Etruscan wife of Jupiter, also striding over the roof. She is carrying her baby, one hand tenderly supporting its bottom. The very ripples on her dress indicate her movement. Whatever else these statues may be, they are definitely not Roman. They are far less static, for a start. Unlike the Roman pantheon, the Etruscan gods were not highly mythologized; they didn’t seethe with the all too human emotions of the Olympian gods. In fact, the relationship between Jupiter was Latona was loving, which is certainly different from the Roman Jupiter, ever on the look-out for nymphs to seduce, and his vengeful wife, Juno. The early Etruscans were more interested in the gods as personifying natural phenomena, like their chief god, Tinia, the god of lightning. They had weather gods who were often indeterminate; some gods having both male and female personas. The Etruscans mind-sets were obviously very different. I particularly liked the decorative antefixes along the edge of the roof, each one individual. There’s something about the energy of Etruscan statues and decoration which I find very attractive. Yes, they borrowed architectural ideas from the Greeks, (Magna Graecia lay to their south) but they retained their own language and artistic originality. The Etruscans come across to me as very much their own people, living in independent city states. This was fine for over 500 years but, when Rome began to expand her territory in about 400 B.C., the Etruscans were unable to combine effectively against a common enemy. It was the beginning of the end. 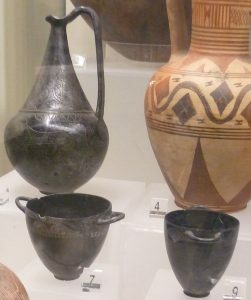 Their bucchero ware, an entirely Etruscan invention, became famous and has been found all over the Mediterranean. It was incredibly thin, with a shiny black exterior, and came in supremely elegant shapes. 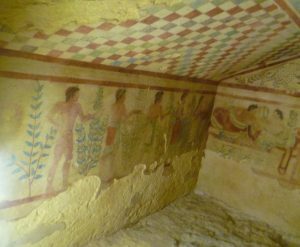 Early Etruscan tomb, Populonia, 9th century B.C. 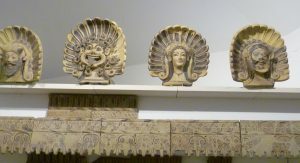 In antiquity, the Etruscans were known as being a supremely religious people. It was an Etruscan priest who gave Caesar the warning about the Ides of March. And we can see from the archaeological record that they were also very concerned about the proper burial of the dead. 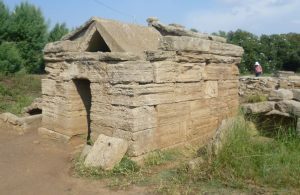 Some of the earliest tombs in Populonia, have been well preserved thanks to seven meters of industrial waste from iron processing in the 5th century B.C. being dumped on top of them. 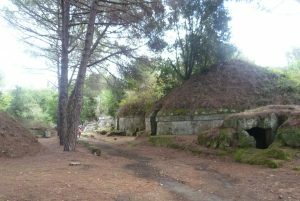 Entrance to tomb at Pellegrini, 3-2nd century B.C. Later, tombs were underground and you can see that there is a steeply stepped entrance. It’s like entering Hades, which was, presumably the point. Some of the actual sarcophagi are still in situ and there are a number of them, so, presumably, it was a family tomb. It would have also contained a number of grave goods. 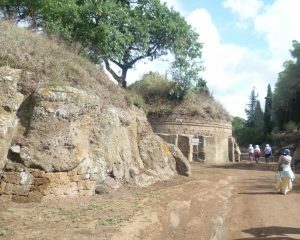 Some of the most famous tombs come from the Monterossi cemetery outside Tarquinia. Over 8000 have been discovered, a number of which are painted inside. On the outside, the cemetery looks like field full of large tumuli, and each tomb has its own steeply stepped entrance going down into the ground. A painted tomb’s limestone walls were given a plaster skim coat and a rough design was sketched out with a pointed implement. The pictures were painted with various vegetable and mineral dyes. The scenes depicted are often of banquets, with music and dancers, and the photo above shows scenes from a tomb which is reasonably well preserved. Unfortunately, the breath of thousands of visitors has gone a long way towards destroying much of the decoration. In the local museum, there are some watercolours of the Monterossi tomb paintings from the 1930s, which show how bright they once were. 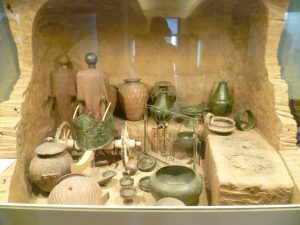 Of course, most of what was once inside the Etruscan tombs has long since vanished, but the museums are full of the most spectacular objects. I love this statue from a couple’s tomb. I like the way the husband has his arm around his wife. They look animated and pleased to be together. I can imagine a bubble coming out of the lady’s head, saying, ‘What about a drink, darling?’ It’s an informal pose, unlike Roman funerary statuary which looks stiff and awkward in comparison. Ceveteri view, dating from the 7th century B.C. The cemetery at Ceveteri looks almost like a town for the dead with streets and roads. It’s set amid umbrella pines and it has a wonderfully calm and peaceful feel about it. You can go inside most of the tombs but there’s not much to see; it’s steep, dark and damp and what was once there has long gone. But I really like it for its atmosphere. 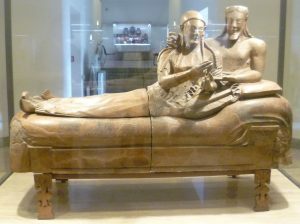 So, what else is different about the Etruscans? Their language relates to no other known language – not even Basque or Hungarian. We can read it because in the early 7th century B.C. they adopted and adapted the Greek alphabet. Experts have transliterated what we have from vases and stele and we know roughly how it sounded and what it means, but that’s about it. Unfortunately, the Etruscans wrote on linen, not papyrus, and that rarely survives. The Roman Emperor Claudius thought them interesting enough to write a History of the Etruscans, which has, unfortunately, not survived. We don’t know what the Etruscans thought of themselves and their own history, in their own words. So, I still think they are a mysterious people. Interesting, as always. The statue of the couple is beautiful. Thank you, Jan. I’m so glad you like the status of the couple. It looks beautiful from the back too, with his arm gently draped over her shoulders. I know very little about the Etruscans so this was an eye-opener, even though as you say they are still pretty mysterious. Thank you for this. Thank you for your comment, Elizabeth. 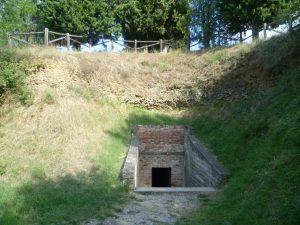 The Etruscans are well worth discovering! If you ever find yourself in Tuscany, there are sure to be some Etruscan remains around. Interesting and edifying post. Thank you! It is a grievous loss that so little should be known about this legacy society. Thank you, Steve. I agree about the loss. 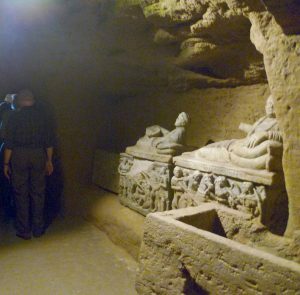 It would be wonderful if the Emperor Claudius’s History of the Etruscans were discovered! Or, even better, an educated Etruscan’s own history of his – or her – people. Thank you, Rosemary. I’m delighted you enjoyed the post. Inspired by your thoughts and imagery, I took some time last night to view images of the Apollo of Veii. The garment details are *amazingly* lifelike. And that face! Spirit invests and informs this work. Please forgive the interrogative, but may I be so bold as to ask: What was it about the statue that caused your hackle raising reaction? Interesting that, alone of the Achaean pantheon, Phoebus Apollo retains his name across the cultures. What a great post, Elizabeth! The statue of Apollo raised the hairs on the back of my neck, Steve, not my hackles! Hackles, in the UK at any rate, are what a dog, say, raises when its about to attack. It’s a gut reaction, really, a combination of awe, attraction, and a sort of spiritual satisfaction; that’s the nearest I can come to it. It’s what I have called elsewhere, ‘the WOW factor’. I had a similar reaction when I first saw the temples at Paestum. Agreed, humans don’t have hackles. I was casting about for fewer words to express hairs-rising-on-the-back-of-the-neck. A day later and I still can’t think of any. Sensing something not-quite-right, I did look up hackle before posting – so I knew it was wrong in advance. ‘Visceral’ was my next choice (! ), but I felt it was potentially rude or off-putting somehow and perhaps entirely too presumptuous. Ultimately, I went with “hackle raising reaction” for the alliteration. Ye-gads, I did agonize over that word choice. Guess I intuited I was going to be called on it. I’m a writer, Steve; I, too, agonize over the right word! With regard to the WOW Factor, I did a post on it on 26th June, 2016, looking at the Telamon at Agrigento in Sicily. You may have been there. Never been to Sicily, sad to say. Turns out there is a word to describe hairs-rising-on-the-back-of-the-neck. That word is Piloerection. So I could have written ‘…what caused your piloerectile reaction?’ Still, it’s awkward and clinical. Mystery solved thanks to my encyclopedic spouse, Mary. Thank you (and Mary) for that bit of erudite information, Steve. Somehow, I don’t think it’s a word I’ll be using. I prefer ‘the Wow factor’, which is less prone to misinterpretation. It’s a good thing I had finished that mouthful of coffee before reading “Somehow, I don’t think it’s a word I’ll be using”, because I had an explosive LOL moment there. Writer indeed. I had meant to say earlier it ‘won’t be finding its way into my prose anytime soon’, but shortened up my post. Much prefer your wording. Speaking of writing, I would like to ask a question off-camera. Would you mind dropping me a line at my address of record?